“Financial Review Sunday wins ratings timeslot” says a headline today on the Australian Financial Review. And while the show certainly had a strong start at 197,000 for Nine it actually wasn’t the leading show at 10am. That honour went to Franny’s Feet on ABC2 with 213,000 viewers. 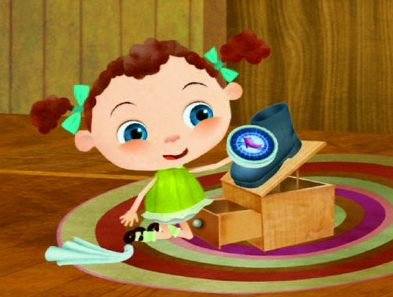 The animated Canadian show about a four-year-old who tries on various pairs of shoes and travels to different places in the world aired for ten minutes at 10am. But Nine’s branded entertainment show did launch well, beating The Bolt Report 147,000 and ABC1’s Inside Business on 132,000 (an evening replay on ABC News 24 was 24,000). Its opening story on Coles was rather lightweight but Joe Aston’s ‘Rear Window’ segment proved to be spirited fun. It’s tricky to report Sunday morning results because few of them run head to head in every city. Seven has AFL Day in some cities. Some ABC shows have replays. Even TEN repeats Meet the Press. It had 86,000 in the morning but 118,000 in its replay. 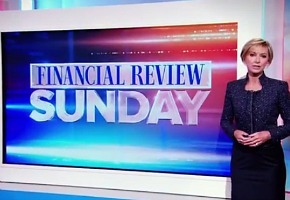 The top-rated morning show overall was Weekend Sunrise at 333,000, but it wrapped by 10am before Financial Review Sunday started. The show is good, but with ads, it’s too short and needs to be a 1 hour show. First of all i havent even heard of this show. Secondly David the Seven Network’s sports show is called AFL Gameday, which airs on 7 in traditional afl markets (cities) and on 7Mate in NSW and QLD at the same time. I like financial review but this show being on the Nine network is not that appealing. If they have to dumb things down then its not worth the air time. A financial/business type show is supposed to be intelectual and informative not dumb down. Hopefully they improve i know becaue i havent seen this show i probably shouldnt comment about that but considering some commenters have already said it was dumb down and considering that commerical FTA dumb downs or sensationalises its news content then iam in a way entitled to make that assumption. I still content that the only smart commercial news program left is NBC Meet The Press over on Seven. a great start to Financial Review. It’s all happening with local content now on Sunday mornings. It’s action packed! lol. I hope the numbers didn’t drop much for Wide World of Sports and The Sunday Footy Show, as they were bumped 30 minutes to make way for Financial Review. I wouldn’t mind checking it out but there is no full episode online just a few highlights. Other shows such as the ABC sunday morning shows such as inside business or offsiders have replays on iview available within a few hours. I don’t understand why channel nine doesn’t do this. I think Financial Review Sunday could be extended to 1 hour if they want better analysis of business and financial information. A great show with Deb Knight. I was really looking forward to this show but the Coles story was really dumbed down. The poor guy awkwardly throwing a mandarine from hand to hand in slo-mo was most unnecessary. I wanted to hear more of what he had to say. Looking forward to some improvement over the coming weeks. The Fin Review set was too bright for my Sunday mornings!! !